When it comes to shopping for the best baby activity center, you’ll want to choose one that has lots of toys to keep your little one entertained and engaged. In addition, you’ll want one that’s safe, well designed, sturdy, is nicely themed and can grow with your child, giving you real value for money. You also want the comfort of knowing that any activity center you choose will aid in your baby’s development. We’ve taken all that and more into account while spending hundreds of hours researching the best activity centers for babies, ensuring that each of our selections met our strict criteria. So we’re certain that on the list below, you’ll find the perfect infant activity center to suit your precious little one! The Skip Hop Explore And More Baby’s View 3 Stage Activity Center provides your infant with toys to play with and explore, visual stimulation and exercise. This activity center is designed for babies age 4 months and up. It comes with a polyester seat that rotates 360 degrees so your infant can play with all the different toys that are scattered around the rim. This activity center allows your child to sit, swivel and bounce as they explore over 25 different fun activities. Some of these activities include clapper or slapper trees that sway back and forth as your child slaps them, a peek-a-boo owl, a cloud with beads, a hedge hog spinner, and a snack bowl. There is also a piano that your baby can play with their feet and a clear window that allows them to view the light up piano and watch themselves play it with their feet. You can also add a few more clip on toys to this activity center to help keep baby happily playing. As your child grows, this activity center converts to a smooth surface to be used a play table. This play center is PVC, BPA, and Phthalate Free. It has a weight capacity of 28 pounds and needs AAA batteries for a run time of 2 hours. This activity is very well thought out and designed. The toys are all designed to encourage your child to explore a variety of different fun activities that will stimulate their eyes, their sense of touch, and their mind. The spinning seat not only allows your baby to play with all the different toys, it also allows them to get a complete view of the room and everything that is going on. As well as that, it provides them with leg strengthening exercises. The toys on this activity center are easy to keep clean because they can be removed and washed throughly and then put back. 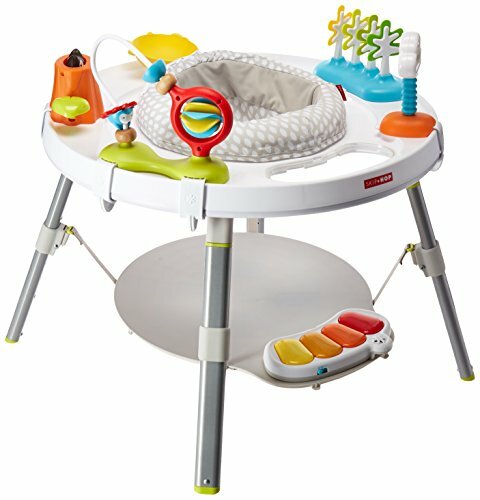 This activity center easily moves from room to room so that your baby can play while you attend chores througout the house. The Skip Hop Explore And More Baby’s View 3 Stage Activity Center is a great toy that can provide your baby with both exercise and items to explore and play with, keeping them happily learning and occupied. Babies love it and love spending time in it playing with all the toys! If you are looking for an activity center that will grow with your child and last for a few years rather than several months, then this Bright Starts Around We Go 3-in-1 Activity Center Zippity Zoo may be the perfect choice. Rather than a built-in seat, this activity center has a seat that is attached to a table and rotates around the table, allowing your baby to explore the various activities, over 15 in all. The seat is height adjustable so it will grow with your infant as they mature. Then once your child outgrows the seat, it can be removed and the table can still be used as a play table. 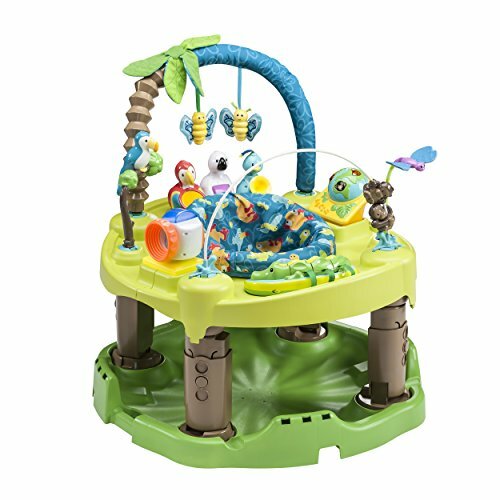 This activity center comes with 3 play modes and includes such toys as a piano, popping characters, a bead station spinner, a flip book with sounds, and a teethable palm tree. These toys keep your infant stimulated and help them to learn more about the world they live in. You do need 3 C batteries for some of the activities, but you get 180 hours of battery life on one set which is great. The Bright Starts Activity Center is a great alternative to a walker for homes that have stairs and is a great toy center for infants and toddlers that will keep them happily entertained and exploring. Extremely easy to assemble, it takes most people no more than ½ hour to put together completely and have it up and ready for your child to play. It encourages your child to use their legs to rotate the seat around the table, which helps to strengthen their leg muscles helping prepare them to stand and walk by themselves. Parents like that this activity center holds their child securely in the seat while allowing them to walk with support. Infants love this Zippity Zoo activity center and have great fun playing with the toys! Made from a combination of plastic and polyester, this Baby Einstein Rhythm Of The Reef Activity Saucer features 12 activities for your baby to explore. Featuring a padded and comfortable high back seat, the activity center is sea creatures themed which will capture your infant’s attention. One of the toys included in this saucer is a light up piano that has 3 play modes – melody, individual notes and language learning in three languages English, Spanish and French. Other toys include a striped fish, crab, and octopus spinner, a whale and aquatic plants. There are beads on a wire that your child can move back and forth helping to develop their fine motor skills. The rotating seat helps your baby develop their leg strength and gross motor skills preparing them for sitting, standing and walking. The seat is adjustable and it comes with volume control to help protect baby’s hearing and parent’s sanity! There are also additional links so parents can add more toys to help keep their baby happily playing. This Baby Einstein Activity Saucer is easy to put together although some parents advise that you do pay close attention to the directions to get the toys in the right places where they fit. It allows your child to turn the seat using their feet so that they begin to develop the leg muscles needed for standing and walking on their own. It has plenty of fun toys for your child to play with and explore. The bright colors of these toys will capture your infant’s attention, and the lights, sounds, all the various activities will keep them happily playing for several minutes at a time. 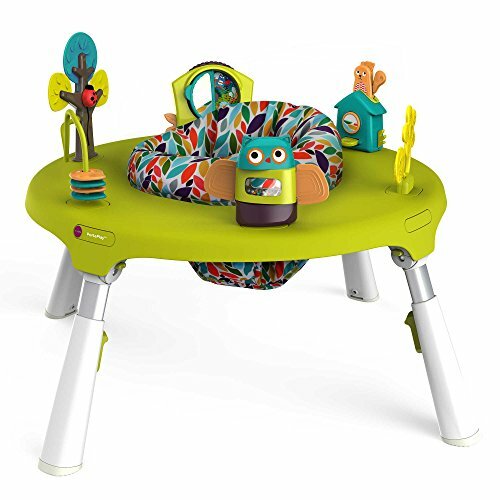 This Activity Saucer has three adjustable heights so it will grow as your infant grows, allowing your child to use it until they are ready to walk. It will help your infant discover that their own actions can produce certain desired effects as they bang on the piano keys to produce noise, move the beads back and forth, and use the other activities. All of the toys and activites have been designed to aid your baby’s development. 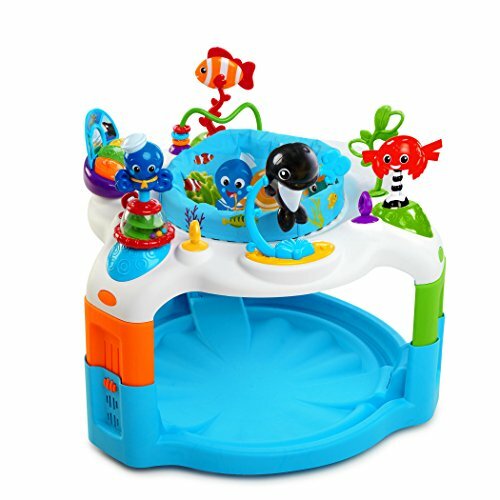 This Baby Einstein Rhythm of the Reef Activity Saucer is an entertaining activity center for slightly older infants who can hold their head up on their own and are ready for that next stage of development. It takes 3 AA batteries and has a battery life of about 24 hours. Loads of fun for your infant! The Evenflo Exersaucer Triple Fun learning Center is made from durable plastic with a polyester seat and a pad for floor play. This triple fun exersaucer set is designed for infants from birth to 2 or 3 years and folds up easily for travel and storage. The Learning Center measures 31.5” X 30” X 30” and comes with a carry handle and 11 fun toys for your baby to explore and play with. The toys include butterflies, a dragon fly, monkeys, an alligator, birds, and a camera. Three of the toys need AAA batteries to operate, 9 in total. The learning center also plays music. All the toys that play music or are battery operated have off switches. The Play Pad is lightly cushioned and can be laid on the floor. The arch for the learning center with the butterflies and dragon flies can be placed on the pad for your baby to look at, reach for and play with when lying on their back. Once your infant can hold their head up unassisted, then they will be able to sit in and use the Learning Center. The seat of the Learning Center will allow your older infant to rock, spin, and bounce. All the toys will be at their disposal as they rotate the seat 360 degrees so that they can explore various toys and play to their hearts content. Once your child is beginning to walk on their own, the Learning Table can be converted to a S shaped Activity Table so that your toddler can continue to play with and explore the toys they have come to love. The S shape of this play table will allow your child to play with a friend. With the ability to rock, bounce and spin, this Learning Activity Center provides your infant with plenty of leg exercise for gross motor development that will help them stand alone and walk when the time comes. This learning sensory has plenty of activities to stimulate your child visually, with sounds and with touch. As your child reaches and grasps things, this activity center will help improve your their hand-eye coordination. 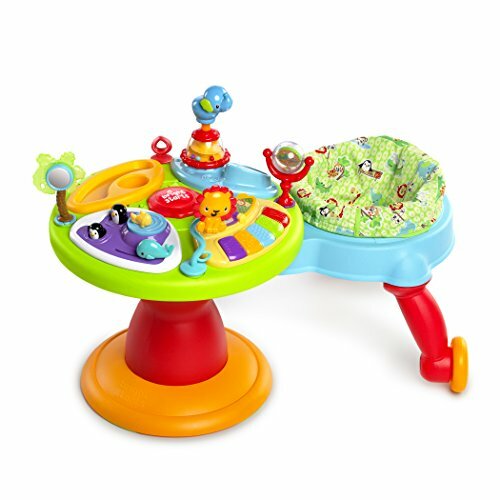 Like most activity tables/exersaucers, this Learning Activity Center will help your infant to quickly learn that certain actions on their part will result in certain things happening. This teaches your child about simple cause and effect. The Life In The Amazon Learning Center is an excellent value for money activity center that will entertain your child for several years. The Oribell PortaPlay 4-in-1 Foldable Activity Center is a simply made and wonderful little activity center that has a forest theme and allows your child to turn and bounce. The bounce comes from elastic bands built right into the seat. There are several woodland themed toys for your child to play with, including an owl with beads, a tree that has a lady bug that can be moved up and down, a flower teether, a mirror, a bead chaser and a birdhouse. Once your child begins to walk on their own, the Portaplay turns into a nice little table that they can use to draw or play with PlayDoh, work puzzles or have a tea party. You will need to purchase a seat or two to go with the play table. While there are not a lot of toys that come with this table, you can attach other toys and Oribel promises that they will be adding more toys for the PortaPlay that you can purchase. This activity center doesn’t have any lights or music nor does it require batteries, making it fun but simple for your child to enjoy. It allows your baby to turn 360 degrees and to bounce which will help them to build their gross motor skills strengthening their legs to prepare them to stand alone or to walk. As your infant plays with the different toys that comes with this activity center, they will be improving their grasping and other fine motor skills. It will also help your infant’s cognitive development as they learn how to play with the various toys and it is extremely sturdy and well made. This Oribel Activity Center grows with your child allowing them to continue playing with the table until they are 3 or 4. It has easy to fold up legs making it great for storage or traveling. Great fun for your baby who will enjoy the bouncing seat! If you’re looking for an awesome activity center that will allow your infant to make music and have tons of fun, the Fisher Price 4-in-1 Step ‘N’ Play Piano is the perfect one for you! Designed to grow with your child right from the time they’re a baby until they become a toddler, this play center has 4 stages: tummy time, sitting up, walking and toddler activity table. The soft removable play mat is ideal for tummy time and playing the keyboard while lying on the floor. Once your baby can sit up, there are all kinds of fun ways to play while sitting in the comfy seat. As your baby grows and is ready to start walking, it transitions to a stationary walker. And finally, once your child is walking on their own, you can remove the seat so your toddler can totally jam out! 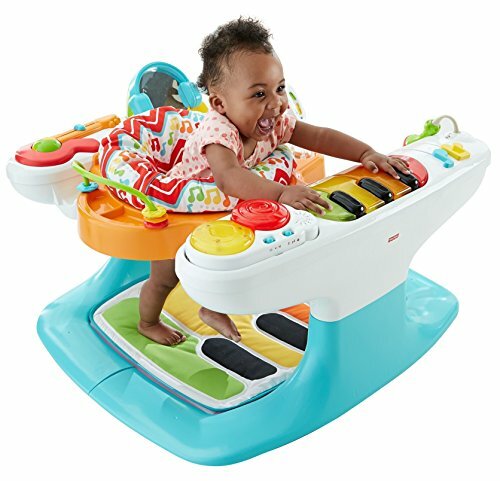 This Piano activity center consists of a plastic keyboard that sits on one side of the seat and a soft foot keyboard that’s the perfect size for your baby’s little feet. And every time your baby presses a note, they’ll be treated to a fun musical sound. How cool is that! Other wonderful features include light up drums for visual stimulation, sliding note clickers, tambourine rattles, a guitar with a roller ball, a microphone, and a headphone mirror. The comfortable seat of slides from side to side, strengthening your infants legs while allowing them to play all the keys on the floor mat. It also rotates 360 degrees so your infant can reach every fantastic musical toy and activity. The seat height is adjustable, the seat pad can be removed for machine washing and this activity center takes 3 AA batteries (not included). With 20+ toys and activities, the Step ‘N’ Play Piano is sure to be a big hit with your child and one that will grow with them for several years! It’s tons of fun for your baby! The Bright Starts Sweet Safari Bounce Around Activity Center is a colorful activity center with 12 different activities for your baby to explore and master. This activity center features a seat that both bounces and turns 360 degrees so that your baby is able to reach all of the attached toys. Some of the toys include birds, a lion bead spinner, palm tree, mirror with ring and a bead chaser. The center does not play music, but some of the toys do make sounds when your infant manipulates them. There is also a small built in snack tray. This activity center provides your infant with healthy exercise. Reaching strengthens their arm muscles while bouncing or turning in their seat aids leg muscle development. This helps your child to get to ready to stand on their own or to walk. The center will also help your child develop both their gross and fine motor skills as the bounce, spin, reach, and manipulate each of the activities. The Sweet Safari Bounce Around helps develop your child’s hand-eye coordination as they reach for the activities they want and manipulate the bead chaser and other toys. It stimulates your infant’s senses, offering them visual stimulation, different textures to explore by touch and different sounds. This activity center is quieter than most other centers and provides parents with a much needed break. It doesn’t take very long to assemble and most parents feel that it is easy to put together causing few, if any, problems while assembling. You should not put your infant in the seat of this activity center until they can hold their head up on their own. Babies love all the toys in this activity center and the fact that the seat bounces! 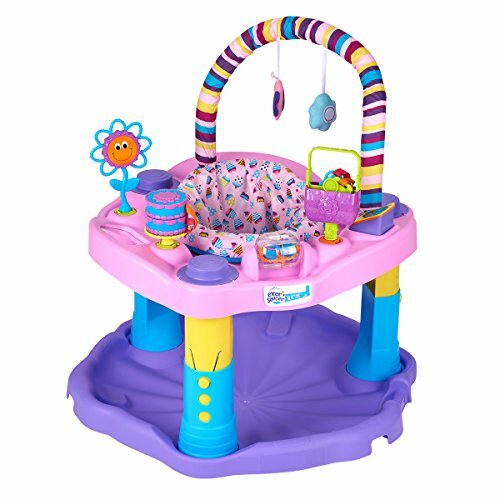 Your baby girl will love the Evenflo Exersaucer Bounce And Learn Sweet Tea Party activity center! 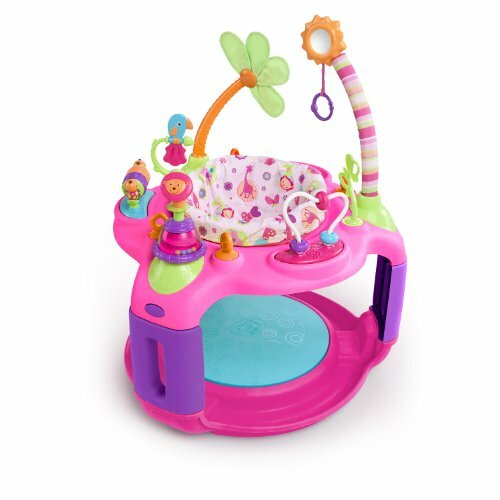 Designed especially for girls, this delightful exersaucer is a colorful and fun activity center for your child to explore. It comes with a purse with removable items, a cake, flowers, butterflies and a spinner. Other awesome features include different textures, sounds, and colors for your little girl to discover. Plus the seat allows her to rock, bounce and swivel around 360 degrees, ensuring she can reach every activity and toy this exersaucer has to offer. It has a machine washable seat cover and with just the push of a button, it easily adjusts to 3 different heights, which means it will grow with your baby. This activity center is a wonderful way to develop your daughter’s motor skills and encourage her to exercise her legs and stretch her neck and spine muscles. Recommended for babies who can hold their head up, the Bounce And Learn Sweet Tea Party is the ideal activity center for little girls who are ready to explore more of the world around them. It’s safe, fun and provides your baby girl with lots of different kinds of stimulation. The Kolcraft Baby Sit And Step 2-in-1 Activity Center is a wonderful way to keep your child entertained and stimulated! The activity center stays stationary for babies but then easily converts to a walker once your child is ready to start walking. There are 10 fun activities for your child to explore, including a spinning bear globe, a mirrored flower, a textured bear paw bead chaser, and a clicking bumble bee spinner. There’s also a toy arch with dangling koala and panda toys and 2 loops where you can add your baby’s favorite toys. A seat that turns 360 degrees makes it easy for your baby to reach and enjoy all the toys and activities. Plus the height of the seat adjusts, so this activity center will grow with your child. The seat holds children up to 30 lbs and the seat cover is removable and machine washable, making it easy to clean. 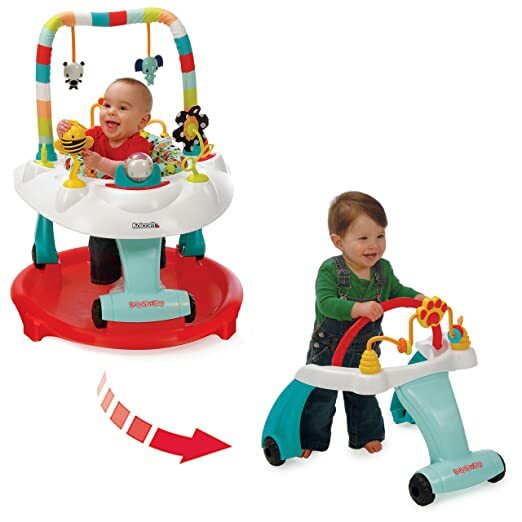 Once your child is ready to start walking, the push walker is easy to detach. Its wide, sturdy frame and large, smooth, easy rolling wheels give extra support for babies who are still unsteady on their feet. As with any activity center, do keep in mind that your child needs to be able to hold their head up on their own before using this activity center. The Kolcraft Baby Sit And Step 2-in-1 is a fun activity center that will grow with your child give them lots of wonderful types of stimulation along the way. And the added bonus is that the detachable push walker will also provide them with the safety and security they need to take those first steps when they’re ready. Lots of fun activities and toys for your child to explore and discover!